It used to be a truism that bigger was always better - especially in the games industry. Every year of growth has led to bigger budgets, bigger development teams and bigger action setpieces. But with all this talk lately about the Big Three and banks that are Too Big to Fail, it's time we recognize some of the smaller shops that are pushing the industry forward even as the big boys are cutting back. That's the idea behind The Escapist's Indie Developer Showcase, a 10-day celebration of the designers and programmers who have struck out on their own to make the games they want to make. Each day we'll feature a new game or demo by an up-and-coming indie developer along with a brief interview. Some games are already commercially available, some are works in progress, but all are free to play. To see who's on the schedule or check out what you've missed, click here. Enjoy! Will Stallwood and Dain Saint are Cipher Prime, an independent studio based out of Philadelphia who has created a game that merges the woozy aesthetics of flOw with the audio-based gameplay of Electroplankton to produce a totally unique puzzle-solving experience - all from the comfort of your web browser. Click the screenshot to play demo. "Auditorium is very dear to our hearts. We've incorporated three things we love into one streamlined experience: music, art and puzzles. The basic concept was to have a game with these ideals that could be started with a child-like curiosity and build from there. Auditorium has no language except for the name itself. 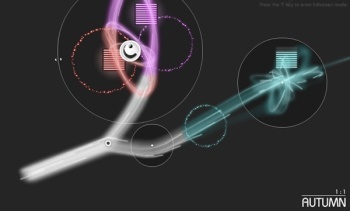 When the game starts off, you're presented with one control, one goal and one beautiful white stream called the Flow (we named the Flow after the popular game flOw by thatGameCompany); feedback teaches you how things work along the way. As you play around more with the controls, you learn new and interesting ways to solve the puzzles. Almost every puzzle can be solved many ways. Auditorium is a game about discovery more than anything else. Every act presents a new item or concept to play around with." "Like any good project, it's never finished. We did a demo at a local LAN event in South Jersey called the GXL and received some great feedback. After changing things around from what we saw and heard, we released the demo a week later. However, we come up with new ideas and build new solutions every day. The full version of Auditorium coming out at the end of January is miles ahead of our little demo." "That's sort of a double-edged sword. When you develop games in a two-man team, things like Auditorium are large scale. Our total development time has been about seven months so far, and we plan on releasing additional updates once we go live, so it won't be over soon. We have a lot of other game ideas we want to start working on and are looking for the right people to work with. These game ideas are just as large in scope with a bigger team." Will: For me, the most enjoyable game experience I had in 2008 was Super Stardust HD for the PS3. That game has completely blown me away in every way. I am a huge fan of arcade-style games done right ... a lot of games these days have too much plot/depth to get what I feel is a meaningful play. I also really enjoyed World of Goo, Team Fortress 2, SWAT 4 and my favorite game of all time, Ikaruga. Dain: You probably wouldn't know it from Auditorium, but I'm incredibly ADD, so I love reaction-heavy games. This year, that's meant Super Smash Bros. Brawl (though Melee is still a bit more to my liking), the new release of Puzzle Fighter and a bunch of little flash games like N the Ninja and the flash versions of Mirror's Edge and Portal. Will: A lot of my inspiration comes from juggling. I'm an avid juggler and spend countless hours a day honing my non-existent technique. That moment when you're learning a new trick and you suddenly go from "knowing it's possible" to "showing it's possible" is the perfect "eureka" moment. Juggling also teaches you that failure is a good thing ... every time you drop a ball you are given insight into how you can improve. When you can't improve anymore, then things just become boring. Dain: I'm into a lot of physical activities that involve real-time problem-solving - capoeira, parkour, racketball, rollerblading. Anything that keeps my heart rate above 120 bpm. Did I mention I played a lot of Sonic as a kid?